Hee hee hee!This was a fun one to do. This one took me longer than usual to do, since I was practicing a technique that a friend of mine taught me about outlines. Anyway, here in this picture, Kirby got so used to riding Dedede in Kirby 64, that he decided to stick with Dedede rather than return to his old friends (Rick, Kine...etc.). 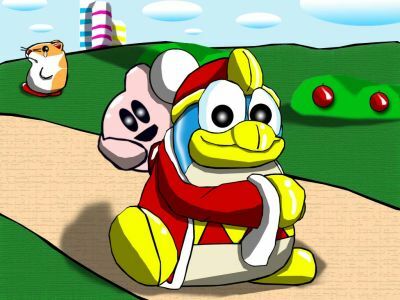 Hopefully, they will revive the animal friends...but for now...Kirby rides on...with King Dedede! Enjoy, Everybody!